Given the forecast for dry weather and partly cloudy skies on Tuesday followed with rain by midnight, I really wanted to get out and ski. I convinced David Coleman to join me, and so we made plans the night before to head for Inter Glacier on Mt Rainier. We also mentioned other possibilities like Fryingpan Glacier or something in the Goat Rocks, but Dave needed to be back in Seattle by 8 PM and so we wanted to keep the trip moderate in length. Tuesday dawned gray and dreary in town, but a 5:30 AM glance at the Paradise and White Pass webcams showed clear skies and beautiful sunshine above the cloud deck, lifting my spirits and reinforcing my faith in the weather forecast. We finally left town around 7 AM, after Dave was massively delayed by an accident at Mercer which had clogged I-5. Along the drive south, we switched plans to try 7930 ft Old Snowy Mountain via McCall Glacier in the Goat Rocks, since neither of us had skied that route or peak before. It seemed to be not much more demanding of a trip (8.5 miles one-way, 4600 net gain) than Inter Glacier (5 miles, 5400 gain), but this turned out to be a severe misjudgment and underestimation on my part. Anyway, we saw a few sun breaks on the way to Cayuse Pass and then broke into full sunshine by Ohanapecosh, enjoying a brilliant morning on US 12 through White Pass with fine views of the Goat Rocks massif (see photo, Mt Curtis Gilbert at left, Old Snowy Mtn at right center). We set off hiking up the North Fork Tieton Trail from the 3300 ft Scatter Creek trailhead at 10 AM, hoping optimistically to be back by around 5 PM. I hoped we would hit continuous skiable snow before 4800 ft Tieton Pass, but there were only a few snow patches by then on the mostly south-facing trail with some continuous snow visible in the creek valley below. Occasionally there were nice views across the valley of the imposing north face of Tieton Peak. The trail is in poor shape, 15-20 medium to large trees are down across it and several sections of tread have been destroyed by heavy horse traffic (I assume they clear the downed trees at the start of each summer and then the horses ruin the trail). A soaking tumble during a botched creek crossing provided an extra delay along the trail, filling my Gore-Tex boots completely with water. Luckily the warm sunshine soon dried my clothes, although the boots may not fully dry for days. Patchy snow continued along the PCT south of Tieton Pass, looking nearly continuous by 5000 ft, but still unexpectedly interspersed with lengthy bare sections especially on open or southerly slopes. We delayed changing to skis and skins far too long because of these bare patches, postholing for an hour in the generally 0-4 ft of softening snowpack on the PCT and then dropping down and across on the trail marked "McCall Basin - Dead End". At least the low snowpack made finding and following the trails easy. We finally decided to switch to skis soon afterwards, but a lengthy delay was needed to dry out our thoroughly soaked feet before donning ski boots. Within a couple minutes, we had reached the meadows of McCall Basin at 5160 ft, but another lengthy delay was needed to reattach Dave's skins with duct tape due to a sudden near-complete adhesive failure. The route into upper McCall Basin follows the edge of a steep creek gorge through a narrow gap between cliff bands, and luckily there was enough snow on this northerly slope to skin up without difficulty. The back side of the gap faces south, however, and was soon devoid of snow, forcing us to skin along the bare unmaintained trail through the woods before reaching a major creek crossing. I just skinned across the creek, Dave hopped and jumped on foot, and finally we had reached continuous snow at 5300 ft, well over 4 hours after leaving the car. Old Snowy was visible for the first time since the drive in (see photo below), and the route through the upper basin and up the McCall Glacier was obvious. Occasional clouds were now building up from the SW, making skies partly cloudy. Numerous old and recent avalanche debris piles were visible at the foot of steep slopes enclosing both sides of the basin. We skinned on softened mush up the gentlest gradient near the center of the basin which angles up and left towards the peak, eventually cutting right to reach the north ridge of Old Snowy at 7650 ft by 4:30 PM. The final nearly 300 ft to the summit did not look skinnable, too many exposed rocks this year, and the steep NE face dropping off the summit looked very appealing to ski but also avalanche-prone at this late hour. These factors combined with a stiff cold westerly wind atop the ridge clinched our decision to abandon the summit, and we decided to ski down from that point. Snow conditions were excellent above 7000 ft, 1-3" of softened corn-like snow on a firm base, with just a hint of a superficial crust reforming in the fading sunlight (see photos: turns on glacier, David skiing with Old Snowy in the distance). No visible signs of crevasses or glacial activity on this section of the multi-lobed McCall Glacier. Below 7000 ft, the snow was deep mush, but at least it wasn't very sticky and the skiing was tiring but quite tolerable. We skied down to the creek crossing, switched to skins, and headed back up and over to the lower McCall Basin. We skinned out along the trail, picked up our hiking boots along the way, and continued along the PCT on snow and dirt and snow and dirt, up and down and up and down. Very slow, but preferable to postholing. Eventually near 5000 ft the skis went back on the packs and we stormed down the trail, missing the junction at Tieton Pass in our haste and continuing nearly a half-mile along the PCT before realizing for sure that we had missed the turnoff and backtracking. Another half-hour down the drain, just one more delay among so many this day. We finally reached the car after 10:30 PM, thoroughly exhausted and over 5 hours later than planned. A difficult drive, including a half-hour roadside nap, a short side trip to Packwood for a 24-hour gas station / food mart, and light rain beginning around midnight (what an accurate weather forecast! ), brought us back to Seattle by 2:30 AM. Old Snowy via McCall Basin is a spectacular and scenic trip, but certainly the demands and effort required are easily underestimated. Total mileage and gain for the day was about 19 miles and 5200 ft counting all the ups and downs, for about 2300 vertical of actual downhill skiing in this very low snowpack year. We saw no one else all day, and the only other faint set of tracks in the snow on the PCT appeared to be several days old. The upper McCall Basin after our ski descent, looking back from just before the creek crossing at 5300 ft around 5 PM. Old Snowy Mountain is the pyramidal sunlit peak at upper left. I would guess that the normal May 1 snowdepth in this basin is about 10 ft instead of the 2-3 ft we found this year. Amar, that's a sweet shot of Dave, looking up to Old Snowy. Dave, rip it up! I dig the R:EX tips. This brings back good memories. Thanks Amar! Another good run is to go in Conrad Meadows and out McCall Basin. Thanks for the report, Amar - looks like now is the time to go. I think Sky is and will always be the king of torture points. This trip would have been like an easy stroll in the park for him. Maybe if he'd come along he could have just carried us on his Herculean shoulders through all the tough parts. Greg, I'm inclined to think that the trip would be easier once all the snow on the trails to McCall Basin melts, thus avoiding the postholing vs. dirt/snow skinning dilemma. Maybe only 1-2 weeks of typical May weather would do it. The upper basin above the 5300 ft creek crossing should still have good continuous skiable snow all the way to the summit at that time. But now would be fine, too, as long you know what to expect. I think I might prefer to camp in upper McCall Basin the next time I do this route (probably not this year), to have more time to explore the high country and perhaps traverse the entire McCall Glacier to Mt Gilbert. His plan for tomorrow (today) gives me much to debate the 'torture aspect' of Sky's gluttonous appetite. "Let's meet at 7pm," pretty much puts this one day painfest in perspective. Amar - Your lack of confidence and endless pessimism are almost funny. Could you give Sky just a few more strokes?? Nobody is carrying me in or out on any given trip, any time. Sky: Now you know how Amar really feels about you. Amar - Your lack of confidence and endless pessimism are almost funny. �Could you give Sky just a few more strokes?? �Nobody is carrying me in or out on any given trip, any time. What the #$%^??? I was almost getting ready to carry you out this time, when you were about to take that nap on the trail . . . But I was really dead on the drive home, thanks for taking the wheel for the last hour. that was called a 5 minute rest while I returned my phone calls (my best impression of Ben Kaufman), and to check in with the boss to tell him I was going to miss our soccer match! Amar and Dave-Very impressive trip for a day trip. I guess day trip qualifies in a 24 hr period for you boys. I am very interested in the route you traveled to Old Snowy. I have had that trail highlighted for some time now as a short approach. Amar-I am really impressed by the details of your adventure and how I could follow it along on my map. One other approach given that the road is clear is the Johnson Creek road to Chambers Lake. Kind of a South approach-just not sure if it would fly and it may be a longer route, but the trail could be clear longer? What mountain is in the backround of the McCall Basin photo? Were you able to sneek a peak into the Packwood Glacier? One other approach given that the road is clear is the Johnson Creek road to Chambers Lake. Kind of a South approach-just not sure if it would fly and it may be a longer route, but the trail could be clear longer? What mountain is in the backround of the McCall Basin photo? Were you able to sneek a peak into the Packwood Glacier? Joe, the SW approach from FR 2150 via Snowgrass Flat is the standard route to climb Old Snowy Mtn. It's definitely the shortest and fastest route to the summit, about 12 miles round-trip. I skied that route to Snowy-Ives Col in June 2000, but there are a couple of negatives for that route as a ski trip. The first 2 miles of trail to Goat Creek gain and lose about 400 ft of elevation, and they follow a SE facing slope which loses snowcover very quickly in spring (and FR 2150 is not open in winter or early spring, adding about 3.5 miles each way). The uppermost southern slopes of Old Snowy above 7400 ft also lose their snowcover early, becoming totally bare and unskiable (that's why we didn't summit in 2000, and headed for the highest skiable snow at Snowy-Ives Col instead). In contrast, the ski terrain and snowcover is far superior in the NE-facing upper McCall Basin (it's called "Glacier Basin" in Beckey vol. 1, but there are way too many Glacier Basins in the Cascades). That route should be continuously skiable from the summit block into July of a normal snow year. And the North Fork Tieton Road (FR 1207) should be open to the end by late March most years, making it a viable early spring approach, too. In the McCall Basin photo, that's another view of Tieton Peak, showing the NW Ridge and West Face which are getting prematurely bare this year. The Packwood Glacier is hidden down and out of sight NW of where we reached the N Ridge of Old Snowy. Wow. I was comparing the photo in Amar's report with the photo in Burgdorfer's book (pg 214). *Quite* the difference in snowpack! How viable is this as a solo outing? Your trip report (and Burgdorfer's book) make me want to check it out as an overnighter in a few weeks but the instant I read "Glacier", I pause to contemplate..
*Quite* the difference in snowpack! Joedabaker - Thanks for the kind comments; yeah, I guess you could that very long day trips are the norm for some of this posse. Scole - I certainly think this is doable as a solo trip. If you've got topo and altimeter in hand, there shouldn't be a problem. Following the trail is pretty straightforward, with the exception of the error that Amar and I had. The signs are relatively easy to spot (eye level in the trees, when you come upon them) which allows you to get your bearing when you get to those points on the map on where to go (Amar has also spelled it out well in his write-up). I'd wait until things are a bit more consolidated for avi safety reasons (since it is so remote, and few head out there). As for crevasses/sags, etc. I didn't see any, and not sure it becomes a real concern either. I'd say ultimately it comes down to your comfort level. Scole, I had somehow forgotten that Burgdorfer's book included this route in the current edition, the first edition has the opposite approach from Snowgrass Flats. Thanks for reminding me. Greg, that's a nice photo for comparison. The huge difference is even more remarkable because last year was well below normal, snowdepths at 5400-5900 ft in the southern WA Cascades on May 1, 2004, were only 70-80% of normal (this year they are 30-40%). The even deeper snowpack shown in Burgdorfer's photo is probably closer to normal depth. I agree with Dave's comments. I mentioned to him during the trip that I was glad to have a partner along, as it would have been a bit scary and lonely to be so far from any possible help (and any other people at all) in case of an accident or injury. Regarding the glaciers in the Goat Rocks, I think that skiers generally don't bring ropes/harnesses when skiing those areas. However, these are still moderately active glaciers and there is some small risk of falling in a crevasse or (more so) a bergschrund. I think the lobe of the McCall Glacier above McCall Basin is fairly inactive, but the eastern parts of it along with the Tieton and Conrad Glaciers are more active. There's a useful aerial photo on p.73 of Beckey vol.1 showing extensive crevasses and large bergschrunds on the Tieton and Conrad Glaciers in late summer. I had somehow forgotten that Burgdorfer's book included this route in the current edition, the first edition has the opposite approach from Snowgrass Flats. Thanks for reminding me. I have the old edition with the Snowgrass approach. That's why inquired about the Johnson Creek road. Every summer I pull out the old Burgdorfer book and dream of that ski run and have yet to make it happen. Amar-I see that you and Dave followed the book to the letter. 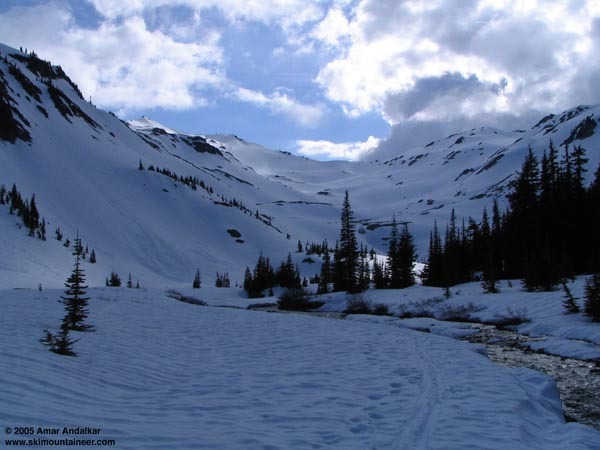 "The backcountry skier is advised to ski conservatively and decend if there are signs of approaching bad weather." Your trip went without a hitch!